NEW YORK — Stocks are tumbling Monday as technology and internet companies continue to take steep losses. The Dow Jones Industrial Average briefly fell 500 points. Retailers and industrial stocks also fell. Apple and Microsoft dropped almost 4 percent while internet retailer Amazon and aerospace company Boeing each fell 5 percent. Nissan sank after its chairman was arrested on misconduct charges. KEEPING SCORE: The S&P 500 index fell 43 points, or 1.6 percent, to 2,692 as of 1:40 p.m. Eastern time. 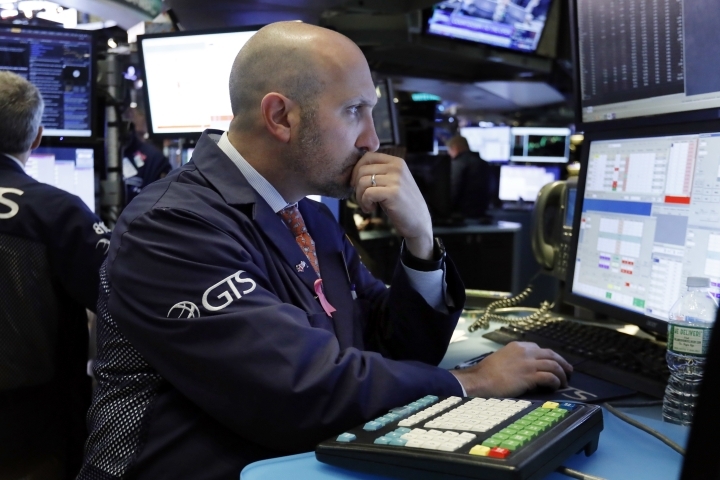 The Dow Jones Industrial Average dipped 410 points, or 1.6 percent, to 25,002. It was briefly down 500. The Nasdaq composite shed 198 points, or 2.7 percent, to 7,049. The Russell 2000 index of smaller-company stocks lost 27 points, or 1.8 percent, to 1,499. Clashes between China and the U.S. at a Pacific Rim summit over the weekend left investors feeling pessimistic about the prospects for a deal that would end the trade tensions between the world's two largest economies. The U.S. has imposed a 10 percent tariff on $200 billion of Chinese goods, and that tariff is set to rise to 25 percent on Jan. 1. Another $50 billion of Chinese goods already is subject to 25 percent duties. Beijing has responded with penalty duties on $110 billion of American goods. Talks continue ahead of a meeting between Chinese President Xi Jinping and President Donald Trump planned for the G-20 summit later this month. TECH LOSSES MOUNT: Apple gave up 3.7 percent to $186.29 and Facebook sank 5.8 percent to $131.50. Microsoft lost 4 percent to $103.98. Chipmaker Nvidia dropped another 8.4 percent to $150.63 after it said last week that it had a large number of unsold chips because of a big drop in mining of cryptocurrencies. The S&P 500 index of technology companies has plunged 13.5 percent since the end of September. BREAKDOWN AT NISSAN: Nissan said its chairman, Carlos Ghosn, was arrested Monday and will be dismissed from the company after allegedly under-reporting his income. Nissan said an internal investigation found Ghosn under-reported his income by millions of dollars and engaged in other "significant misconduct." U.S.-traded shares of Nissan lost 5.5 percent to $16.96. In Paris, shares of Nissan's partner Renault dropped 8.4 percent. SHARP LOSSES: Amazon shed 4.9 percent to $1,515 and Nike slid 3.3 percent to $72.28. Netflix lowest 5.1 percent to $271.68. Boeing sank 5.3 percent to $318.21 and Caterpillar fell 2.8 percent to $126.35. Defense contractor Raytheon lost 3.3 percent to $176.11. ENERGY: Benchmark U.S. crude reversed an early loss and rose 0.2 percent to $56.55 a barrel in New York. U.S. crude prices have dropped for six weeks in a row and are trading around their lowest level in about nine months. Brent crude, used to price international oils, lost 0.6 percent to $66.38 a barrel in London. FIRE FALLOUT: The parent company of California utility Pacific Gas & Electric fell again after it disclosed that it had a power line failure near the start of a deadly wildfire the morning the fire began. The Mercury News of San Jose reported Saturday that the company said in a filing that it had an outage at 6:45 a.m. on Nov. 8 in Concow. Authorities say 76 people have been confirmed dead in the Camp Fire. PG&E stock fell 6.4 percent to $22.85. The stock has lost half its value since Nov. 8 in spite of a big rally on Friday. BONDS: Bond prices rose. The yield on the 10-year Treasury note fell to 3.06 percent from 3.07 percent. CURRENCIES: The dollar slipped to 112.49 yen from 112.83 yen. The euro rose to $1.1454 from $1.1412. The pound rose to $1.2857 from $1.2831. OVERSEAS: France's CAC 40 gave up 0.8 percent and Germany's DAX slid 0.9 percent. Britain's FTSE 100 slipped 0.2 percent. Japan's benchmark Nikkei 225 rose 0.7 percent and Hong Kong's Hang Seng added 0.7 percent. South Korea's Kospi gained 0.4 percent.